, author of the “Anatomy of Melancholy,” the younger brother of William Burton, the antiquary, the subject of the next article but one, was born at Lindley, Feb. 8, 1576, and had his grammatical education at Sutton-Colfield; after which, in 1593, he was admitted a commoner of Brazen-nose college, and elected a student of Christ church, in 1599, under the tuition (though only for form’s sake) of Dr. John Bancroft, afterwards bishop of Oxford. He took the degree of B. D. in 16 14, and was | in that year admitted to the reading of the sentences. In 1616, the dean and chapter of Christ church presented him to the Vicarage of St. Thomas in Oxford, in which parish he always gave the sacrament in wafers; and George lord Berkeley bestowed upon him the rectory of Segrave in Leicestershire. Both these preferments he held till his decease, which happened at Christ church, January 25, 1639—4O. He was a curious calculator of nativities, and among others, of his own; and the time of his death answering exactly to his own predictions, it was whispered in the college, that (to use Anthony Wood’s language), rather than there should be any mistake in the calculation, he sent up his soul to heaven through a slip about his neck; but for this insinuation there appears little foundation. 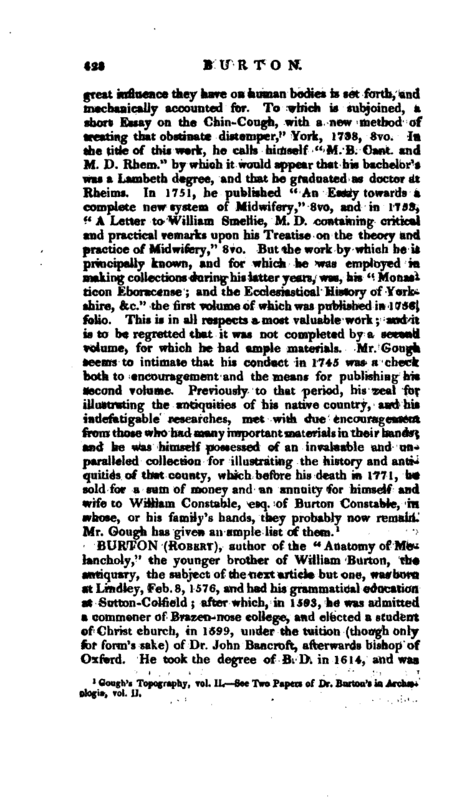 He was a general scholar and severe student, of a melancholy yet humourous disposition, and appears to have been a man of extensive learning, which his memory enabled him to produce upon every subject. In his moral character, he was a man of great integrity, plain-dealing, and chanty. He was principally known as the author of a very celebrated and popular work, entitled “The Anatomy of Melancholy,” published first in quarto, and which afterwards went through several editions in folio, so that the bookseller acquired an estate by it. This book was compiled by our learned writer with a view of relieving his own melancholy; but it encreased to such a degree, that nothing could divert him but going to the bridge foot, and hearing the ribaldry of the bargemen, which seldom failed to throw him into a violent fit of laughter. In the intervals of his vapours, he was one of the most facetious companions in the university. The “Anatomy of Melancholy” is for the greater part a cento, though a very ingenious one. The quotations, which abound in every page, are pertinent; but if the author had made freer use of his invention, and less of his common -place book, his work, perhaps, would have been more valuable. However, he generally avoids the affected language, and ridiculous metaphors, which were common in that age. On Mr. Burton’s monument in Christ church is his bust, with his nativity, and this description by himself, put up by his brother: “Faucis notus, paucioribus ignotus, hie jacet Democritusjunior, cui vitam dedit et mortem Melancholia. Obiit viii. Id. 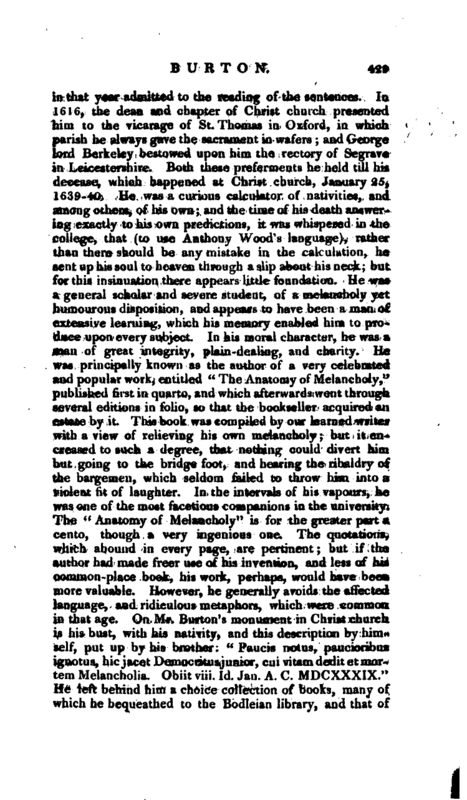 Jan. A. C. MDCXXXIX.” He left behind him a choice collection of books, many of which he bequeathed to the Bodleian library, and that of | Brazen-nose college. He left also a hundred pounds, for a fund to purchase five pounds’ worth of books, every year, for the library of Christ church. Nichols’s Hist, of Leicestershire. Biog. Brit. Ath. vol. 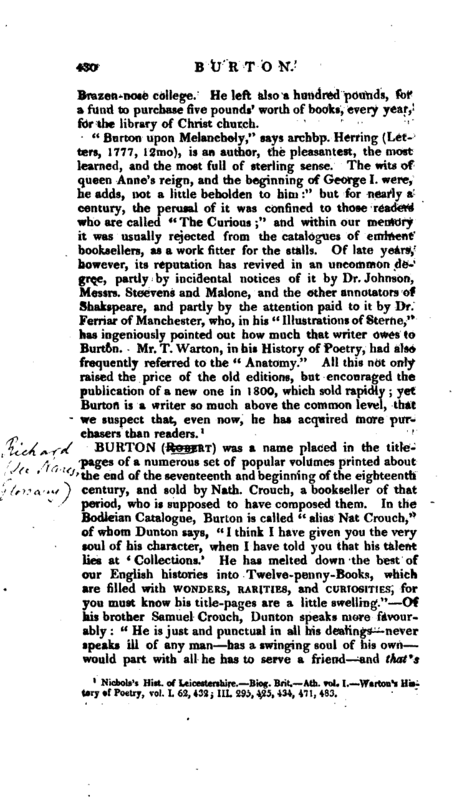 I, Warton’s History of Poetry, vol. I, 62, 432; III. 295, 425, 434, 471, 483.